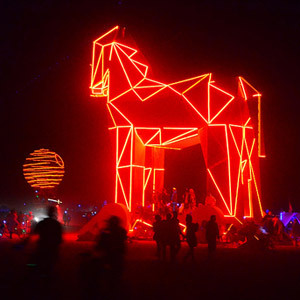 The LED lights gave the whole surroundings of the horse an intense red glow at night. I’ve been on a journey for over a year – a journey that started with a vision and was constantly confronted with doubts from the outside. A journey that challenged me into unknown territories and taught me that everything is doable with an enormous amount of dedication, willpower and organization. A journey that brought me close to many wonderful, committed, energetic and inspiring people. 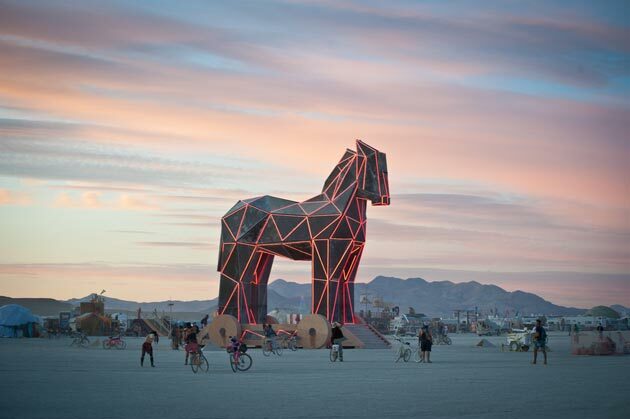 A journey that finally culminated in the construction, celebration, towing and burning of a 50-foot-tall, 25-tons heavy wooden Trojan Horse in the desert of Nevada at the Burning Man festival 2011. 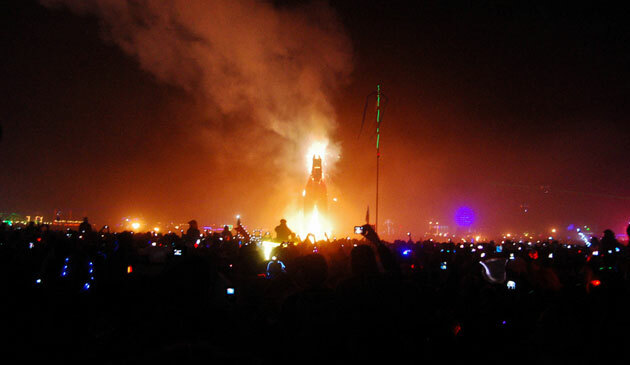 Together with a core-team of 8, and a construction crew of about 20 and an additional large pool of volunteers and helpers, we created a multidisciplinary spectacle combining sculpture, light installation, music, performance, and dramatic arts into what was a major highlight at 2011′s Burning Man festival. It all started out over a year ago at the Banff Centre, where composer Douglas Bevans developed the vision for the project, and soon found willing followers in myself and visual artist Jay Mosher. Together we developed the horse’s cubistic identity, that amplifies the project’s incentive of creating an abstract modern interpretation of an ancient myth. Between the fall of 2010 and the summer of 2011 our team communicated in weekly skype conferences and almost daily emails conversations, learning on the go how to organize finances for such a massive and expensive project, how to make the project community-owned through fundraising, how to communicate the idea and invite volunteers to join, how to organize the sheer amount of volunteers that responded with enthusiasm, how to find the most dedicated construction crew, how to pick environmental friendly materials for the burn, how to set up an art support camp, how to orchestrate a thousands-of-people event, etc. No one of us had done anything close to a project of this scale before! The horse between the obelisks. Finally in August 2010 i went to San Francisco to join the construction crew for the last 3 weeks of pre-fabrication at Nimby, Oakland. The most rewarding days were the once spent measuring, cutting, angling, and assembling triangle pieces – getting covered in saw dust and your hands dirty while seeing the physical manifestation of a sculpture – you’ve edited in 3D programs on your screen for months and months – grow in front of your eyes high into the sky! The rest of the time was spent sourcing materials for the interior and exterior decoration of the horse, planing the power setup for the lighting of the horse, and handling online communication and website updates. And then,on Aug. 21th I started my desert adventure out on the nearly-empty, beautiful playa. On Friday night, Sept. 2nd, the horse burnt after an spectacular fireworks show by Black Rock FX. Taping and stapling LED strips to the surface of the horse. 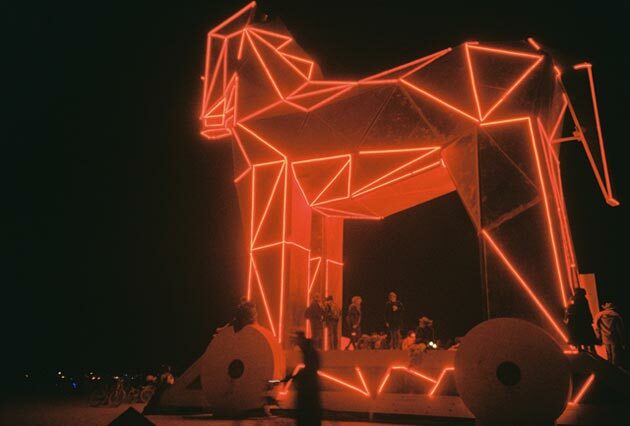 The skin of the horse and the matching obelisk sculptures were lit up with red LED strips that ran along the edges of the triangle panels. 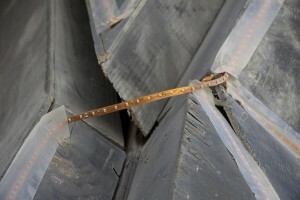 The total length of LED strips amounted to 840 meter! After doing the calculations it showed that the strips contained a total amount of 50.400 LEDs and would require a current of 336 Amp at 12 Volt power. This amount of electricity, needed to be converted from AC (generator) to DC, plus everyone’s cautionary tales about electronics in the Black Rock Desert (see here) were quite scary. After hauling in advance from many parties, and considering several options, I settled down on 8 Power Switching Units, that would power the LEDs on the surface of the horse, segmented into 70 channels of maximum 10-meter strips. This required about 2500ft. 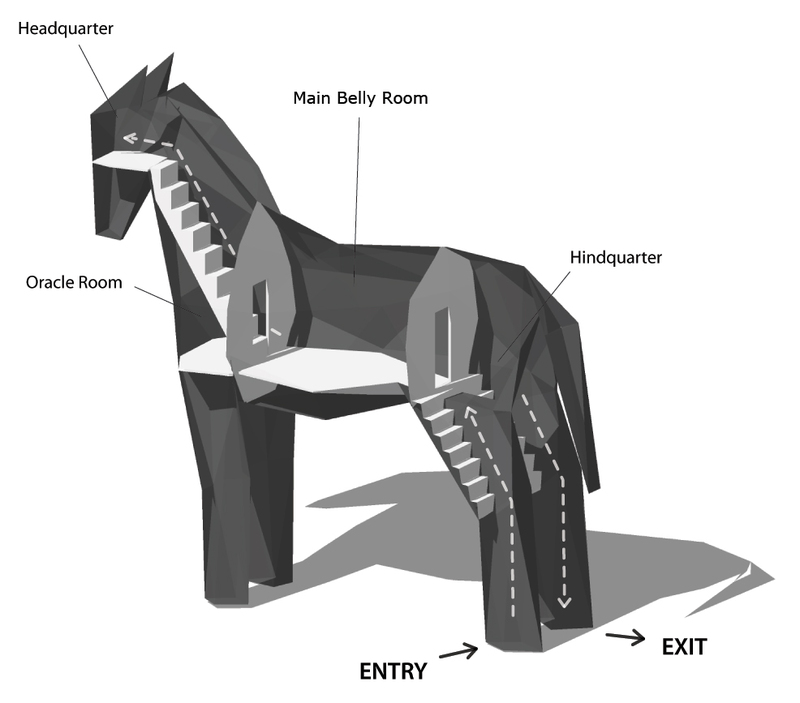 of 16-gauge speaker-wire to lay out the connection between the triangles-skin and the electronics-brain setup in a small room within the horse. I gave up any plans to control/dim the lights and simply focused on getting the lights working. The inside of the horse was dimly lit with EL-wire and some LED bulbs. The back legs were equipped with staircases that functioned as entry and exit gates into the belly of the beast. The main platform housed a triangle-shaped bar serving absinthe – if the visitor revealed his own most significant rite of passage to the barkeeper. Going higher up into the head of the horse, you could look out a narrow window facing towards the Man (the center of Black Rock City’s horse shoe) showing the obelisks serving as the Gates of Troy. And, on Monday night, shortly before it’s official opening, the Trojan Horse turned into a beacon of red light! The outlined edges had a Tron-like quality, that gave the horse a different unique presence at night. I loved how the glow seemed to hum at its own frequency and very much transformed the steps, cart and close proximity of the horse into this otherworldly magical place. The glow of the LEDs was so intense that it not only colored it’s whole surroundings into a red cloud, but also was visible from pretty much anywhere on the playa. It became a beacon for many who wanted to find their way home at night. On Friday, Sept. 2nd we orchestrated the procession and pull of the Trojan Horse. Over 550 slaves lined up along six 300ft. long ropes and pulled the 25-ton horse with too-much-ease along the perfectly solid playa surface. Behind the horse a marching band played Douglas’ composition march, that similar to the horse’s design, represented the use of ancient Greek music traditions in a modern abstract interpretation. At sundown we reached the burn circle behind the Gates of Troy. Before and after the procession we stripped and loaded the horse in preparation for the fireworks show and it’s ultimate death by fire. Shortly after midnight, archers shot flaming arrows and triggered the spectacular fireworks show by pyro crew Black Rock FX. The fireworks show morphed into the burning of the horse, which lasted a long long time. Layer after layer, the horse lost it’s skin panels, showed us its familiar structural skeleton, until it extremely slowly and extremely beautifully and touching collapsed forward onto its chest. That’s me, looking at our 50 foot Trojan Horse. I had some of the best and some of the worst experiences out there. I feel an enormous bond to all the team members that helped create this adventure. 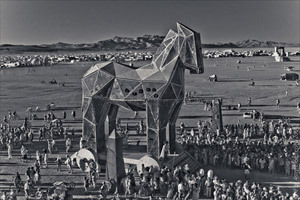 Building this horse and figuratively walking through fire with everyone left such strong impressions, that even my first Burning Man experience couldn’t trump. Maybe i’ll return, maybe not. 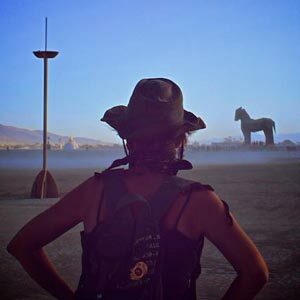 But i’ll definitely never feel as proud out there again as this year – walking around Black Rock City and never letting go of this giant majestic horse in the distance, that seemed to have this magnetic pull on me. 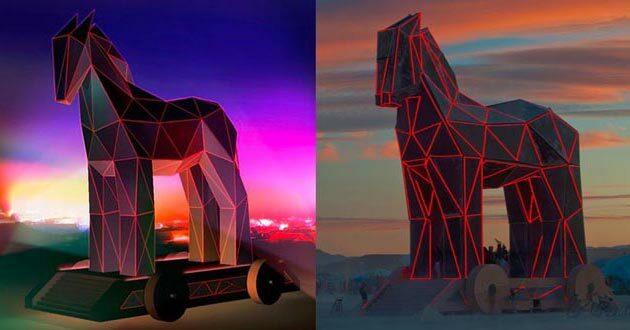 Posted in Projects and tagged 2011, burning man, Douglas Bevans, fire, Jay Mosher, LED, lighting, performance, Trojan Horse.